Is the industry taking advantage of this group of codes as a tool to collect social determinant data? As new care and reimbursement models take hold throughout the industry, the need to accurately capture data on social determinants has taken on greater importance. Gaining a better understanding of factors outside of health that affect individual patients and patient populations and integrating that knowledge with clinical data can help tailor clinical and social interventions, improve care coordination, and identify the most appropriate modes of care. According to "Integrating Social And Medical Data to Improve Population Health: Opportunities and Barriers," published in the November 2016 issue of Health Affairs, the need for more thorough capture of social determinant data led the National Association of Community Health Centers to establish preliminary links between its social determinants of health screening items and ICD-10 in the form of Z codes, which reflect patients' social characteristics. According to the study, these codes, in combination with the mandated adoption of ICD-10, are "an attractive option for a standardized approach to data aggregation." 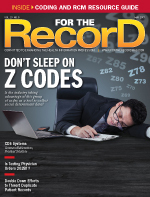 So, in the nearly two years since ICD-10 became law of the land, has the use of Z codes lived up to its promise? The answer from many industry experts is "sort of." "Although the type of information and volume of Z codes may or may not be lacking, their use definitely is lacking in the outpatient clinic setting," says Elizabeth Morgenroth, CPC, a senior consultant with Culbert Healthcare Solutions. "While facilities have HIM-trained coders, at least for inpatient purposes, clinics have a tendency to either use physicians as coders or untrained, uncertified personnel as coders. Neither of these individuals may see the value in the reporting of Z codes, nor may they understand their proper use in reporting the factors influencing health care encounters or services. "In addition, our reimbursement systems are not configured in such a way as to incentivize ambulatory clinics to make a real effort to describe patient conditions and factors influencing patient health at this time, and claim volume is such that true documentation review and education in properly describing these with diagnosis codes is understandably prohibitive." Adds Christopher Gaarlandt, MSBI, RHIA, CDIP, director of coding quality and performance at nThrive, "The institution of Z codes was for more specific descriptions with a higher level of detail for both health care professionals and insurance companies. That accomplishment is yet to be fully realized, as Z codes are still new and the initial data collection is still in process. However, with statistical analysis and data mining, this shows to have great promise." Z codes can be used as principal or first-listed diagnosis in some circumstances, including aftercare and special therapies such as chemotherapy. What makes them particularly valuable for population health is their use in indicating whether patients carry a disease, have the residual of a past disease, or have another factor influencing their health status. "This is important to know from a statistical and data analysis perspective because it drives how the Z codes are used and collected," Gaarlandt says. Examples include indications that a person is not currently ill but is still encountering the health service for a specific reason (eg, to act as an organ donor, medical observation for suspected diseases, administrative examinations, or reconstructive surgery), and indications of the birth status of newborns. Morgenroth notes that Z codes are also useful in reporting risk factors such as a family history of a condition, which increases the risk that the patient will develop the same condition. And, as more cause-and-effect relationships are discovered through reporting and research, Z codes can be used to report them. "Z codes, when properly used, can be powerful in reporting socioeconomic conditions that may influence a patient's health status," Morgenroth says, adding that additional codes for preventive services may be used in the future to demonstrate whether an annual wellness visit is of value in certain populations. "Physicians now have the ability in the clinic setting to express patient noncompliance with a medication due to financial reasons. It is codes such as these that enable a physician or nonphysician practitioner to send a loud and clear message that a patient's health may be placed at risk due to the cost of a drug which could cost less than an acute inpatient stay." There are challenges to widespread Z code adoption for population health management, such as the sensitive nature of the questions required to collect comprehensive social determinant data. For example, queries regarding homelessness can be uncomfortable. Providers may be concerned with confidentiality issues while patients may be hesitant to respond honestly for fear of judgment. In some states, there are laws prohibiting physicians from asking certain questions. For example, until February 2017, it was illegal in Florida for physicians to inquire about the presence of firearms in the home. However, prohibiting the questions from being asked doesn't mean it cannot be recorded if the information is offered voluntarily. "While it may be illegal in some states to ask patients personal questions, which could lead to assigning a social determinant, patients may freely share valuable and pertinent information with an examiner," Morgenroth says. "It is not a provider's place to make a judgment; however, objective documentation of observations may very well be appropriate. Patients do have an opportunity to share pertinent past, social, and family history during the course of an encounter. In fact, these items are considered relevant to the gathering of information used to determine medically necessary services." Morgenroth cites transitional care management as an example. "It is perfectly reasonable and appropriate to ask whether a patient has adequate transportation to receive needed services in the ambulatory setting to prevent an inpatient readmission. While no judgements are made as to the socioeconomic status of the patient, it can be a factor in a patient's access to needed services," she says. Others believe the value of the information gleaned from inquiries pertaining to social determinants supersedes any restrictions on questioning as long as the questioning is handled appropriately. "Any perception of illegality is likely rooted in a misunderstanding of the HIPAA rules," says Karen Karban, director of coding services at CSI Healthcare IT. "Obviously, one wants to preserve client confidentiality, so you would not expect these intrusive questions to be asked in a public location such as a waiting room or a registrar's desk. This type of questioning should be done only by a health care professional in the actual encounter setting." Besides their impact on population health, the data collected by Z codes may also contribute to success under value-based reimbursement models, in large part due to their granular nature. The Health Affairs study noted that social determinant data "can inform the design of two distinct types of alternative payment models: performance-based incentive payments and penalties, and population-based payments." For example, a 2014 National Quality Forum (NQF) report recommends that performance assessments be risk adjusted for social determinant factors that influence clinical quality outcomes to prevent unfair performance penalties on providers whose patient base skews heavily toward low socioeconomic status. Readily available social determinant data would help performance-based initiatives incorporate the NQF recommendations. On the population-based payment front, emerging reimbursement models, which include capitation and partial-capitation models, may motivate providers to be more attentive to social determinants. This information can also inform capitation payment arrangements, while new types of payments designed to reimburse and therefore promote care management and case coordination activities can be refined using social data. "Although there is limited influence of Z codes in the inpatient setting, Z codes can have a tremendous influence in demonstrating medical necessity of diagnostics in the outpatient setting," Morgenroth says. "Many payers, unfortunately, still see all Z codes as screening services, and these services would be denied in any patient contracts that do not allow screening services. This makes correct reporting of risk factors that justify diagnostic screenings for patients difficult and prevent early detection of a condition that would be much more costly to treat if not discovered until it is symptomatic. The inclusion of preventive services in most health coverages due to the ACA [Affordable Care Act] can make a difference in the future utilization of Z codes, if appropriately reported in conjunction with these services." Karban further notes that "the social determinant codes themselves do not have a current impact on reimbursement, but there are discussions occurring about embedding them in the value-based payment calculations. It will be important to keep tabs on how this movement progresses." Two major factors are influencing the utilization of Z codes. The first is the ability of an organization's EHR to properly capture the information, according to Karban. "EHRs are continually undergoing updates, revisions, and widespread technology improvements. Current EHR systems bear little resemblance to the initial efforts of 10 to 15 years ago," she says. "Quality [EHR] vendors are doing their best to keep up with the times and that was a requirement as we transitioned to ICD-10. Z codes are a part of the entire ICD-10 code set. Any issues with their capture are not likely related to the EHR system." On the other hand, many industry experts say the quality of documentation to support Z code selection is a tougher obstacle to overcome, with part of the blame lying at the feet of EHR construction. Gaarlandt says much of the problem stems from insufficient documentation being available in the EHR at the time of coding, noting that "a lack of documentation clarifying the circumstances in which a Z code would be coded has just as large of an impact" on utilization of Z code data as the EHR's ability to capture that information. In the ambulatory clinic setting, Morgenroth points to the quality of the templates, problem lists, and diagnosis selection as having a great impact on optimal use of Z codes because of the role they play in the quality of documentation to support the reporting of patient conditions. "While the templates' and associated problem lists' greatest impact is their ability to serve as a checklist for the examiner, they also serve as a blueprint for documentation and a reminder of other possible conditions which may influence treatment and medical decision making," she says. "The underlying systems which are used to assign a final diagnosis or clinical impression by an examiner is one of the biggest challenges physicians will face. Unless physicians are coders themselves, they will not appreciate the value of the specificity of ICD-10-CM, and most EHRs use similar methods of diagnosis search and selection. "In my experience, I have not seen a single EHR which prompted a physician to append additional codes if and when they were appropriate, nor have I had the pleasure to see an EHR which truly assisted the provider in assigning a code which described a patient's condition to the greatest level of detail," Morgenroth adds. Despite their potential impact on emerging care and reimbursement models, Z codes are still underutilized. Karban points to several factors, including the lack of a mandate requiring their use. "One needs to consider that coders have a mandate to code only from physician or physician extender documentation," she says. "If any of the relevant information contributing to the capture of social determinant codes is made by another health care professional—nurse, social worker, EMT [emergency medical technician], dietitian, etc—the coder will be unable to code on the basis of that documentation. From a clinical documentation improvement aspect, coders would not normally generate a query for the condition because of the need to focus primarily on those conditions that could impact reimbursement." Despite the many obstacles standing in the way of optimal Z code utilization, the capture of social determinant data is likely worth the additional effort for the long-term value the information brings to health care's push for higher quality, more efficient care. As the Health Affairs study concludes, "Identifying a clear process for collecting and aggregating data on social determinants of health is an important next step toward transforming health care, refining value-based payment, and ultimately influencing both health- and nonhealth-sector strategies to improve population health."